BACKGROUND: Healthcare utilization and the cost implications associated with undiagnosed and/or misdiagnosed narcolepsy have not been evaluated, and there is scant literature characterizing the newly diagnosed population with narcolepsy with respect to treatment patterns and resource utilization. OBJECTIVE: To analyze the changes in medication use, healthcare utilization, and the associated costs after a new diagnosis of narcolepsy. METHODS: In this retrospective cohort study, we used data from the Truven Health Analytics MarketScan Research Databases, between January 2006 and March 2013, to identify patients who had a probable new diagnosis of narcolepsy—defined as a de novo medical claim for a multiple sleep latency test—which was preceded by ≥6 months of continuous insurance and was followed by a de novo diagnosis of narcolepsy. The utilization and cost of medical services and the percentage of patients filling prescriptions for narcolepsy-related medications were evaluated in 3 consecutive 1-year periods from the date of a positive multiple sleep latency test result (ie, index date), and each year’s findings were compared with the annualized results from the 6-month preindex period. RESULTS: A total of 3757 patients who met the definition of a new diagnosis of narcolepsy were identified. The total medical service utilization decreased each year from a preindex average of 28.2 visits per patient per year (PPPY) to 26.9 visits (P <.05), 23.1 visits (P <.0001), and 22.5 visits (P <.0001) PPPY in years 1, 2, and 3 postdiagnosis, respectively. In each outpatient service category, the medical services utilization decreased from preindex to year 3 postdiagnosis, including hospital outpatient and physician visits (P <.0001), and other outpatient and emergency department visits (P <.05). The percentage of patients receiving narcolepsy-related medications increased from 54.0% preindex to 77.4%, 70.0%, and 66.9% for years 1, 2, and 3 postindex (all P <.0001 vs preindex). The total medical service cost PPPY was $12,159 preindex and decreased to $10,708, $8543, and $9136 in years 1, 2, and 3 postindex (all P <.0001 vs preindex). CONCLUSIONS: In this study, the confirmation of a diagnosis of narcolepsy was associated with decreasing utilization and associated costs of medical services in the first 3 years after diagnosis. The total costs encompassing medical services and pharmacy costs were relatively stable during this period. There is no known cure for narcolepsy, and most patients require lifelong treatment.15 Nonpharmacologic management of the disease includes patient education and behavioral modifications, such as maintaining a regular sleep routine and daily scheduled naps.1,15,16 Medications used for the treatment of narcolepsy include drugs that are approved by the US Food and Drug Administration (FDA) for narcolepsy-related indications, as well as medications used off label for this purpose (Table 1). Narcolepsy has a substantial economic burden, which is evidenced by higher healthcare utilization and costs compared with patients without narcolepsy, as well as by elevated rates of long-term disability, absenteeism, and presenteeism.3,17-19 Healthcare utilization and the cost implications associated with undiagnosed and/or misdiagnosed narcolepsy have not been evaluated, and there is scant literature characterizing patients with newly diagnosed narcolepsy regarding treatment patterns and resource utilization. The objective of the current analysis was to analyze the changes in medication use, medical services utilization, and the associated costs after a new diagnosis of narcolepsy. 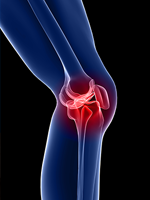 This retrospective cohort study evaluated data from the Truven Health Analytics MarketScan Research Databases. These databases include private insurance and Medicare claims for healthcare services across the continuum of care for employees, dependents, and retirees. Data from January 1, 2006, through March 31, 2013, were evaluated to identify patients who had a probable new diagnosis of narcolepsy, which was defined as a de novo medical claim for a multiple sleep latency test (the objective diagnostic evaluation for narcolepsy), and which was followed by a de novo diagnosis code for narcolepsy (International Classification of Diseases, Ninth Edition diagnosis codes 327.20, 327.21, 327.23, 327.27, 327.29). Further study inclusion criteria required that the diagnosis of narcolepsy be preceded by ≥6 months, and followed by 3 years, of continuous insurance with drug coverage. Having a de novo multiple sleep latency test was defined as a claim with Current Procedural Terminology (CPT) code 98505, with no previous claim with that code, during the ≥6 months preindex period. A diagnosis of narcolepsy was considered de novo if it followed the multiple sleep latency test for a given patient. Because sodium oxybate is only prescribed for narcolepsy, a preindex prescription fill of sodium oxybate was also considered evidence of an established narcolepsy diagnosis; those patients were excluded from the study. Medical service claims during the study period were organized into categories of inpatient admissions, emergency department visits, hospital outpatient visits, other outpatient visits, and physician visits. 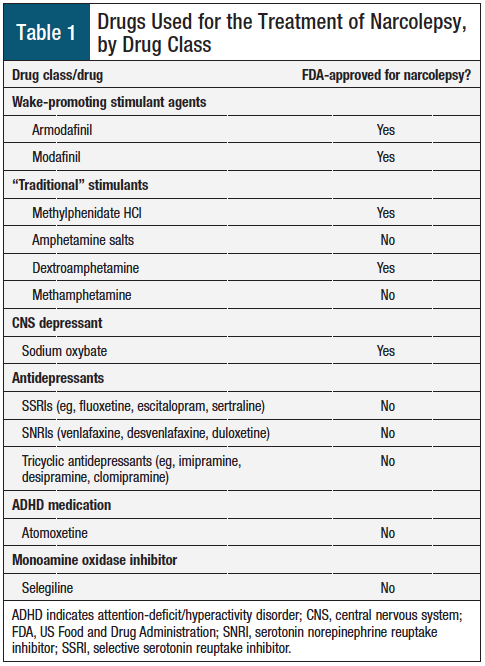 Pharmacy claims (filled prescriptions) were evaluated to identify narcolepsy-related medications, which were defined as drugs and drug categories recommended by clinical guidelines for the treatment of narcolepsy and associated conditions,16,20 with or without an FDA-approved indication of narcolepsy (Table 1). These drugs were categorized as attention-deficit/­hyperactivity disorder medication (atomoxetine hydrochloride), selegiline, anxiolytic benzodiazepines, hypnotic benzodiazepines, miscellaneous sedative hypnotics (mirtazapine, trazodone hydrochloride), nonbenzodiazepine sedative hypnotics, serotonin norepinephrine reuptake inhibitors, selective serotonin reuptake inhibitors (SSRIs), stimulants (traditional stimulants plus the wake-promoting agents modafinil and armodafinil), tricyclic antidepressants, and sodium oxybate. The database did not capture whether these drugs were used specifically for narcolepsy symptoms versus nonnarcolepsy symptoms or conditions. The utilization and cost of medical services and the use of narcolepsy-related medications were annualized for 4 time periods, including a 6-month preindex period preceding the de novo multiple sleep latency test, representing activity before the narcolepsy diagnosis was established, and 3 successive 12-month periods (ie, years 1, 2, and 3). Year 1 began with the multiple sleep latency test (ie, index date) and included the cost of the test. Medical service utilization was evaluated as the average number of visits and/or admissions per patient in each of the 4 periods. The all-cause cost was calculated as the total allowed cost per patient, which was adjusted for outliers, and was averaged over each period. All costs were inflated to 2015 US dollars. The percentage of patients with ≥1 filled prescriptions for a narcolepsy-related medication was assessed for each medication class (Table 1) and in total within each of the 4 time periods. The mean per-patient utilization and cost of medical services by utilization category and in total in years 1, 2, and 3 were each compared with the mean annualized utilization cost in the preindex period using paired t-tests with Bonferroni adjustment. The percentage of patients filling a prescription during each time period was compared by chi-square test with Bonferroni adjustment for each category of narcolepsy-related medications and for any narcolepsy-related medication for years 1, 2, and 3 versus the preindex period; for year 2 versus year 1; and for year 3 versus year 2. All significance testing was 2-sided, with statistical significance defined as P <.05, with Bonferroni adjustment. Statistical analyses were performed using SAS/STAT version 9.2 (SAS Institute Inc; Cary, NC). A total of 3757 individuals were identified as meeting the criteria for newly diagnosed narcolepsy during the capture period (based on a medical claim for a multiple sleep latency test, followed by a de novo diagnosis of narcolepsy). 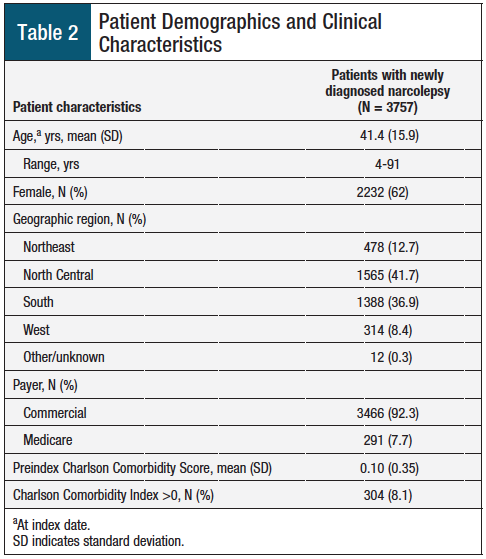 The patients’ mean age was 41.4 years (standard deviation, 15.9 years), and most (62%) patients were female (Table 2). A total of 3018 (80.3%) patients had narcolepsy without cataplexy. The total annual medical services utilization decreased significantly from an annualized preindex average of 28.2 medical claims per patient per year (PPPY) to 26.9 medical claims PPPY (P <.05) in year 1, 23.1 claims in year 2 (P <.0001), and 22.5 claims in year 3 (P <.0001; Figure 1). The changes in overall utilization were driven largely by decreased physician visits and other outpatient services. In the preindex period, 54.0% of patients had claims for narcolepsy-related medications. The most frequently prescribed classes of narcolepsy-related drugs during the preindex period were SSRIs, stimulants, and anxiolytic benzodiazepines, which were prescribed to 23.9%, 17.9%, and 16.1% of patients, respectively (Figure 2). 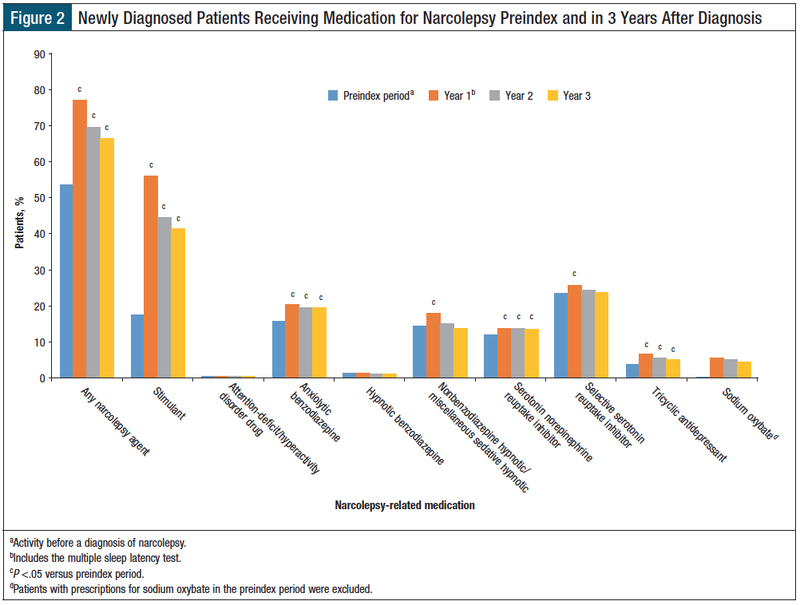 The percentage of patients with pharmacy claims for narcolepsy-related medications was significantly higher during each of the 3 years after diagnosis compared with the preindex period (P <.0001 for all comparisons; Figure 2). The increase in patients with claims for stimulants was the primary driver for the increase in narcolepsy­related medication claims. At year 3, the most often prescribed classes of narcolepsy-related medications were stimulants (41.5%), SSRIs (24.1%), and anxiolytic benzodiazepines (19.9%). Notably, the percentage of patients with pharmacy claims for any narcolepsy-related medication was highest in year 1 (77.4%) after a diagnosis of narcolepsy but decreased significantly from year 1 to year 2 (70.0%), a –7.4% change from year 1 (P <.0001), and again from year 2 to year 3 (66.9%), a –3.1% change from year 2 (P = .004). The decrease in narcolepsy-related medications over the 3 years postindex was driven primarily by decreases in claims for stimulants (ie, modafinil, arm­odafinil, and traditional stimulants) among 56.5%, 45.0%, and 41.5% of patients in postindex year 1, year 2, and year 3, respectively. The annual cost of medical services alone (ie, not including pharmacy) per person was significantly higher preindex ($12,159) compared with year 1, year 2, and year 3—$10,708, $8543, and $9136, respectively (all P <.0001; Figure 3). The decrease in the average cost per person for total medical services was driven primarily by reductions in costs for outpatient hospital visits and physician visits. The single greatest impact on the observed reduction in medical costs from the preindex period and after was a decrease in spending on diagnostic sleep studies; from year 1 to year 2, $1700 (79%) of the $2165 total cost reduction per person resulted from reduced expenditures on sleep studies. Sleep studies of various kinds accounted for 12% of the total medical costs in the preindex period and 18% of the total medical costs in year 1 (which included the index multiple sleep latency testing). In later years, sleep studies accounted for only 2% of the medical costs. The cost increases observed from year 2 to year 3 were driven largely by increased expenditures on musculoskeletal disorders (highest cost category at year 3: $1639 per person), digestive diseases, and neoplasms. The average cost per person for inpatient admissions increased from the preindex period to postindex year 3 ($1857 vs $2439, respectively; P = .0137), although the number of inpatient admissions was very low (average, 0.1 admissions PPPY). 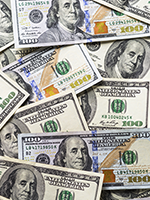 The costs associated with emergency department visits stayed constant. The total (medical and pharmacy) costs were $15,986 PPPY preindex versus $16,061 in year 1 (P = .865), $14,132 in year 2 (P <.0001), and $15,167 in year 3 (P = .0847; data not shown). This is the first published study of the utilization and costs of medical services among patients with newly diagnosed, multiple sleep latency test–confirmed narcolepsy and of the changes in these parameters over time in a large sample of patients in the United States. 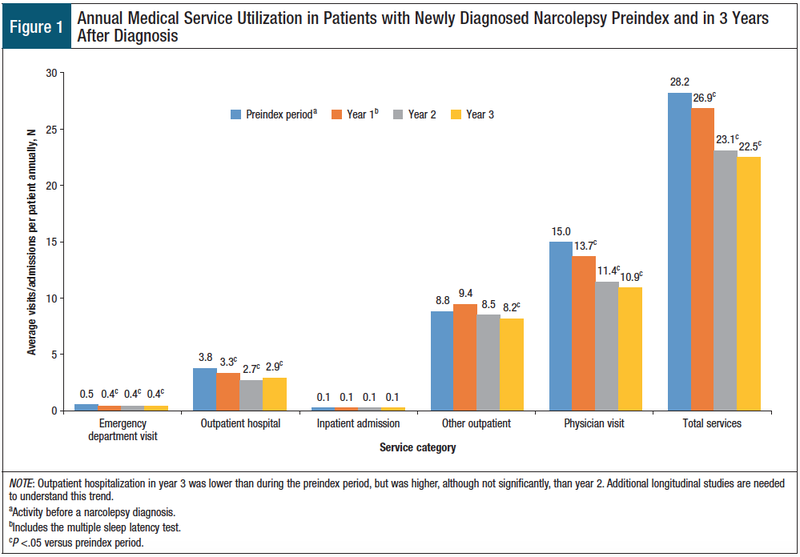 Medical service utilization and some associated healthcare costs were highest in the 6 months before diagnosis and in the first year after diagnosis, but these decreased significantly within the first 3 years after a confirmed diagnosis of narcolepsy. Healthcare utilization and costs likely remained high in the first year after diagnosis as patients and their providers established and optimized a management plan. The total costs for medical services PPPY decreased from $12,159 in the preindex period to $9136 in postindex year 3, a reduction of $3023 (24.9%). The changes in overall service utilization were driven by reduced physician visits and other outpatient services. The decrease in the average cost per person for total services was driven largely by lower expenditures on sleep studies, primarily multiple sleep latency testing and polysomnography. The decline in sleep studies expenses accounted for 42% of the cost reduction of medical services between the preindex period and year 3. The rise in total costs from year 2 to year 3 was mainly driven by increased costs related to other medical conditions. The total combined medical and pharmacy costs remained stable in year 1 and decreased slightly in year 2 (statistically significant, P <.0001) and year 3 (not significant) compared with the preindex period. These findings suggest that timely diagnosis of narcolepsy can lead to reductions in all-cause medical utilization and costs over time and to a corresponding decrease in the socioeconomic burden of narcolepsy. A recent US survey of 300 primary care physicians (PCPs) and 100 sleep medicine specialists found that 24% of PCPs considered themselves “very” or “extremely” knowledgeable about narcolepsy versus 84% of board-certified sleep specialists and 49% of non–board-certified sleep specialists.24 Recognition of individual symptoms of narcolepsy was lower among PCPs than among sleep specialists, but was still low in both groups; only 9% of PCPs and 42% of sleep specialists felt “very” or “extremely” comfortable diagnosing narcolepsy. As expected, the prescription of narcolepsy-related medications increased significantly after a diagnosis of narcolepsy and remained elevated during the first 3 years after diagnosis compared with the preindex period. The most common medication classes used after a narcolepsy diagnosis were stimulants, SSRIs, and anxiolytic benzodiazepines. Drug utilization, especially in the preindex period may, in part, represent treatment for comorbid depression or other nonnarcolepsy disorders. The percentage of patients with claims for narcolepsy-related medications was highest in the first year after diagnosis and decreased in each of the subsequent 2 years; this decrease was driven by a reduction in the claims for stimulant medications, the reasons for which cannot be explained by claims data. One limitation of the current analysis is that the study population represents primarily a commercially insured segment of the US population and may not necessarily be representative of all patients with narcolepsy. As with all claims-based research, the data are subject to miscoding errors, although the concomitant requirements for multiple sleep latency testing and narcolepsy diagnosis codes minimized this risk in the current study. The study inclusion criteria allowed for the possibility, albeit unlikely, of a patient having a repeat multiple sleep latency test erroneously and then being included as a newly diagnosed patient. In addition, the database did not capture whether narcolepsy-related drugs were being used for narcolepsy or for nonnarcolepsy symptoms or conditions. The findings of this claims data analysis show that almost every category of medical services utilization and costs were significantly reduced within the first 3 years after a narcolepsy diagnosis confirmed by a multiple sleep latency test, and the total medical and pharmacy costs remained relatively stable over that period. These findings underscore the importance of a timely diagnosis of narcolepsy from the perspective of the patient and society at large. This study was funded by Jazz Pharmaceuticals. Ms Villa is an employee and shareholder of Jazz Pharmaceuticals; Ms Reaven and Ms Funk are consultants to Jazz Pharmaceuticals; Dr McGaughey is a consultant to Strategic Health Resources, which received funding from Jazz Pharmaceuticals for providing statistical analyses for this study; Dr Black is a part-time employee of Jazz Pharmaceuticals. Ms Villa is Executive Director, Health Economics & Outcomes Research, Jazz Pharmaceuticals, Palo Alto, CA; Ms Reaven is President, Strategic Health Resources, La Canada, CA; Ms Funk is Sr VP, Data Analytics, Strategic Health Resources; Dr McGaughey is Professor, Cal Poly State University, San Luis Obispo, CA; Dr Black is Senior Fellow, Sleep and CNS Medicine, Jazz Pharmaceuticals, and Adjunct Professor, Stanford University, Palo Alto, CA. 1. Ahmed I, Thorpy M. Clinical features, diagnosis and treatment of narcolepsy. Clin Chest Med. 2010;31:371-381. 2. Thorpy MJ. Update on therapy for narcolepsy. Curr Treat Options Neurol. 2015;17:347. 3. Flores NM, Villa KF, Black J, et al. The humanistic and economic burden of narcolepsy. J Clin Sleep Med. 2016;12:401-407. 4. Ohayon MM, Priest RG, Zulley J, et al. Prevalence of narcolepsy symptomatology and diagnosis in the European general population. Neurology. 2002;58:1826-1833. 5. Silber MH, Krahn LE, Olson EJ, Pankratz VS. The epidemiology of narcolepsy in Olmsted County, Minnesota: a population-based study. Sleep. 2002;25:197-202. 6. Longstreth WT Jr, Koepsell TD, Ton TG, et al. The epidemiology of narcolepsy. Sleep. 2007;30:13-26. 7. Longstreth WT Jr, Ton TG, Koepsell T, et al. Prevalence of narcolepsy in King County, Washington, USA. Sleep Med. 2009;10:422-426. 8. Sateia MJ. International classification of sleep disorders-third edition: highlights and modifications. Chest. 2014;146:1387-1394. 9. Dauvilliers Y, Montplaisir J, Molinari N, et al. Age at onset of narcolepsy in two large populations of patients in France and Quebec. Neurology. 2001;57:2029-2033. 10. Frauscher B, Ehrmann L, Mitterling T, et al. Delayed diagnosis, range of severity, and multiple sleep comorbidities: a clinical and polysomnographic analysis of 100 patients of the Innsbruck narcolepsy cohort. J Clin Sleep Med. 2013;9:805-812. 11. Morrish E, King MA, Smith IE, Shneerson JM. Factors associated with a delay in the diagnosis of narcolepsy. Sleep Med. 2004;5:37-41. 12. Unite Narcolepsy. Patient-focused narcolepsy survey: interim analysis as of September 16, 2013. September 24, 2013. www.unitenarcolepsy.org/wp-content/uploads/Interim-Survey-Analysis-v1.pdf. Accessed June 16, 2016. 13. Thorpy MJ, Krieger AC. Delayed diagnosis of narcolepsy: characterization and impact. Sleep Med. 2014;15:502-507. 14. Thorpy MJ, Black J, Gow M, et al. Demographics and diagnosis experience of people with narcolepsy: first wave results from the Nexus Narcolepsy Registry. Sleep. 2016;39(abstract suppl):Abstract 1086. 15. Thorpy MJ, Dauvilliers Y. Clinical and practical considerations in the pharmacologic management of narcolepsy. Sleep Med. 2015;16:9-18. 16. Morgenthaler TI, Kapur VK, Brown T, et al. Practice parameters for the treatment of narcolepsy and other hypersomnias of central origin. Sleep. 2007;30:1705-1711. Erratum in: Sleep. 2008;31:table of contents. 17. Jennum P, Kjellberg J. The socio-economical burden of hypersomnia. Acta Neurol Scand. 2010;121:265-270. 18. Jennum P, Ibsen R, Petersen ER, et al. Health, social, and economic consequences of narcolepsy: a controlled national study evaluating the societal effect on patients and their partners. Sleep Med. 2012;13:1086-1093. Erratum in: Sleep Med. 2013;14:1039-1040. 19. Black J, Reaven NL, Funk SE, et al. The Burden of Narcolepsy Disease (BOND) study: health-care utilization and cost findings. Sleep Med. 2014;15:522-529. 20. Billiard M, Bassetti C, Dauvilliers Y, et al. EFNS guidelines on management of narcolepsy. Eur J Neurol. 2006;13:1035-1048. 21. Baumann CR, Mignot E, Lammers GJ, et al. Challenges in diagnosing narcolepsy without cataplexy: a consensus statement. Sleep. 2014;37:1035-1042. 22. Kawai M, O’Hara R, Einen M, et al. Narcolepsy in African Americans. Sleep. 2015;38:1673-1681. 23. Maski K. Understanding racial differences in narcolepsy symptoms may improve diagnosis. Sleep. 2015;38:1663-1664. 24. Rosenberg R, Kim AY. The AWAKEN survey: knowledge of narcolepsy among physicians and the general population. Postgrad Med. 2014;126:78-86. 25. Wilson SJ, Frazer DW, Lawrence JA, Bladin PF. Psychosocial adjustment following relief of chronic narcolepsy. Sleep Med. 2007;8:252-259. 26. Taddei RN, Werth E, Poryazova R, et al. Diagnostic delay in narcolepsy type 1: combining the patients’ and the doctors’ perspectives. J Sleep Res. 2016;25:709-715. PAYERS: Health plans typically focus on managing patients who drive up medical and pharmacy costs, by screening patients for high-cost conditions and referring patients to care management or disease management programs for follow-up and resource utilization management. The challenge for narcolepsy and cataplexy to be identified as diseases that require closer scrutiny and management is that the typical costs spent by health plans per patient are relatively low compared with other, high-profile or high-cost diseases, such as diabetes or congestive heart failure. The opportunity to evaluate this population of patients and review the total cost of care related to narcolepsy provide keen insight into this relatively unknown disease area. 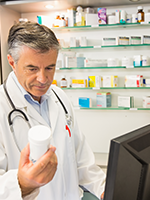 PHARMACISTS: From the pharmacy perspective, narcolepsy gets lost in the pharmacy claims data, because the majority of drugs used in the treatment of these patients have multiple indications and uses. In addition, the vast majority of the medications are available as generic options and do not significantly affect the pharmacy budget. Armodafinil and modafinil were heavily managed in past years, because of their high cost and demand from the providers who manage patients with narcolepsy; however, more recently, generic options have been launched, and the level of management is reduced. Sodium oxybate is the primary brand-name drug in the market and is a high-cost agent that merits utilization management to promote its appropriate use. Many other agents in that category are monitored for the potential of abuse and misuse, and this has focused more attention on the individual drugs rather than on the patients who are receiving treatment for narcolepsy. PATIENTS: This data analysis by Villa and colleagues is a solid effort to begin to assess the impact of narcolepsy and cataplexy on the US health system, and the use of the Truven Health Analytics MarketScan Research database provides a credible data set to examine this disease state.5 The study methodology is sound and attempts to identify opportunities for changes in resource utilization after diagnosis that indicate that a missed diagnosis could lead to significant medical expenses. This effort can help to avoid a lengthy clinical search for a disease when patients present with symptoms and work their way through the healthcare system in search of answers. The study findings point to a reduction in medical resource utilization over time after accurate diagnosis, which is a compelling benefit for health plans that are trying to bend the cost curve. EMPLOYERS: As referenced by the authors, other areas of interest could include the impact of narcolepsy on people’s productivity, as well as absenteeism and presenteeism in the workplace. Although this does not directly affect health plans, employers will benefit from improvements in this condition for their employees. In addition, disability costs could be reduced with improved care and management of narcolepsy in these patients. RESEARCHERS/BENEFIT MANAGERS: This type of analysis helps to move us forward in the science of disease identification and management. 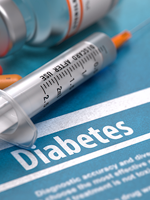 This process could be used to identify additional chronic diseases that need to be extracted from the data warehouses of pharmacy and medical claims. This information could further inform pharmacy and medical benefit managers on opportunities for cost-savings and potential areas to reduce the waste of healthcare resources in the pursuit of an accurate diagnosis for patients. We know all too well that treating a chronic disease earlier in its life cycle will yield benefits to patients, as well as to providers and other healthcare stakeholders. We should welcome more data analyses to expand the basic scientific knowledge of diseases and their treatments. 1. Frauscher B, Ehrmann L, Mitterling T, et al. Delayed diagnosis, range of severity, and multiple sleep comorbidities: a clinical and polysomnographic analysis of 100 patients of the Innsbruck narcolepsy cohort. J Clin Sleep Med. 2013;9:805-812. 2. Morrish E, King MA, Smith IE, Shneerson JM. Factors associated with a delay in the diagnosis of narcolepsy. Sleep Med. 2004;5:37-41. 3. Unite Narcolepsy. Patient-focused narcolepsy survey: interim analysis as of September 16, 2013. September 24, 2013. www.unitenarcolepsy.org/wp-content/uploads/Interim-Survey-Analysis-v1.pdf. Accessed May 10, 2018. 4. Thorpy MJ, Krieger AC. Delayed diagnosis of narcolepsy: characterization and impact. Sleep Med. 2014;15:502-507. 5. Villa KF, Reaven NL, Funk SE, et al. 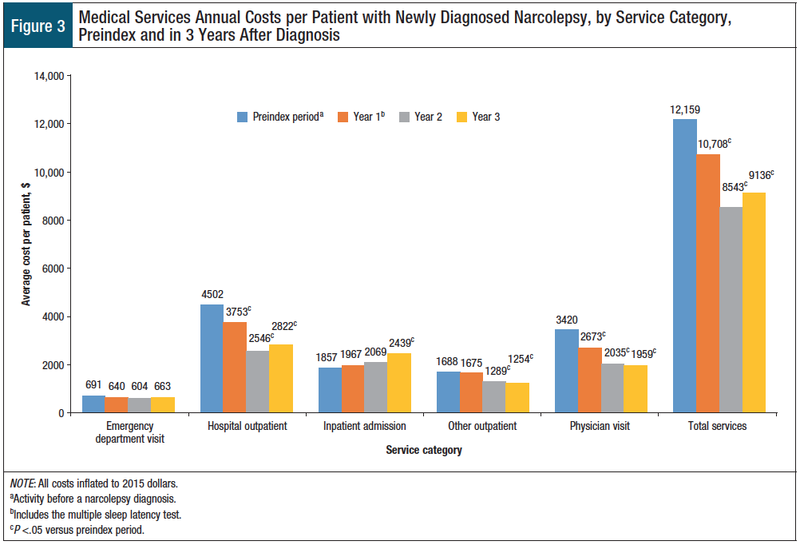 Changes in medical services and drug utilization and associated costs after narcolepsy diagnosis in the United States. Am Health Drug Benefits. 2018;11(3):137-145.